After the Second World War to communicate meaningfully with foreign countries, it was essential in Japan to pursue studies of international problems in order to live a peaceful life in international society. 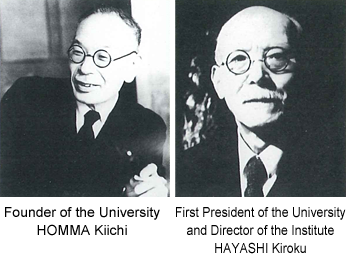 With this keen awareness, Aichi University was founded in 1946 with the aim of “training young people with a broad international outlook and cultural background who would besuited for the building of a new Japan which could contribute to the development of world culture and peace”. This was its founding spirit. 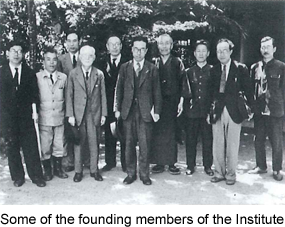 The Institute of International Affairs was established in the same spirit in 1948, with a staff of 23 members divided into the Departments of (1) Foreign Trade Studies, (2) Chinese Studies, (3) Soviet Studies, (4) American Studies, (5) Korean Studies, and (6) General Studies. Aichi University was founded by teachers and students who had returned to Japan from Toa Dobun Shoin University (東亜同文書院大学) in Shanghai, and from the two former Imperial Universities in Seoul and Taipei and mainly because of this history the Institute of International Affairs has always placed emphasis on East Asian and especially Chinese studies. Originally the Institute had for its object to do research in the politics, economy, society and culture of the major countries and nations of the world. But in 1953 its research orientation turned towards the “New China”, as the People’s Republic of China was commonly called then. Indeed among staff members the term “international” virtually meant “Asian” and more specifically “Chinese” in the context of their research activities. Thus the Institute’s Statute, as amended in 1961 and still valid through a couple of further subsequent amendments, provides for “special emphasis on modern Chinese studies” n its research activities. From its early days the Institute carried out research and published its results in a monthly journal, The Journal of International Political and Economic Affairs, which had started in February, 1949. This, however, was not a full-scale Journal such as today’s is, but rather a collection of political and economic articles about overseas affairs for the benefit of people in Toyohashi who volunteered to pay a special fee towards its publication. The monthly mimeographed Journal continued until No.12, after which it was changed to a quarterly. Then beginning with No.14, it appeared in a typed printing in 1951, and No.15 contained several articles and was presented as an academic journal. With No.16, its title was changed to The Journal of the Aichi University Institute of International Affairs, which has remained its title to this day. With regard to its research activities, the Institute undertook its first co-operative research project in 1953. On a government grant of 440,000 yen, it carried out a two-year programme. 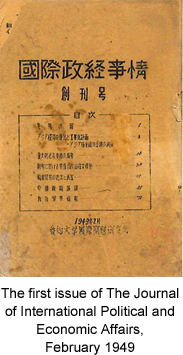 Its findings were later published under the title The State System and Basic Trends in the People’s Republic of China: A Study of the Joint Platform (in Japanese) by a publisher in Tokyo in October 1954. Again in 1955 a joint study was conducted of the New Chinese Constitution over twenty odd meetings from April to August, the result of which was published as The Constitution of the People’s Republic of China (in Japanese) by another publisher in Tokyo in July 1957. This was the first study of its kind in Japan. Another comprehensive study of the “Politics of India and Other Areas in Asia” was the Institute’s next joint study programme to get a government grant of 2.5 million yen in total over a period of five years from 1958 to 1962. The Institute was thereby designated as one of the research institutes for comprehensive studies of the Asian region. The grant enabled the Institute to purchase books and materials about the politics, economy, society and modern history of South East Asia and India, areas additional to its main study target China. Thus a Bibliography of Literature on the Asian Region was published in 7 volumes during the period February 1960 to June 1962. Furthermore a volume on New China and the General Policy Line of its Transitional Period (in Japanese) edited by the Society of Modern Chinese Studies was published by this Institute in October 1955. With respect to research activities of individual members, the results were normally published in the Institute’s Journal. 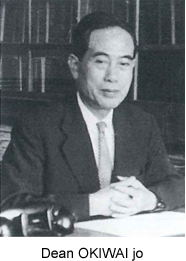 But some other studies were published in book form by the Institute, which included (1) Suzuki Chusei, A History of the Middle Period of the Qing Dynasty (in Japanese) in the Learned Series in 1952，(2) Asai Atsushi, A List of the Laws and Regulations of the People’s Republic of China 1949-1954,1954, and (3) Naitoh Shigenobu, A Bibliography of the Writings of the Late Professor Naitoh Konan, 1954. In the early days the mimeographed Research Materials included (1) Hu Xi, Peaceful Reform of Capitalist Industry and Commerce, and Class Struggle in China: Paper presented at the 6th Scientific Discussion Meeting of the China People’s University on 26 May 1956 (Japanese translation by Noma Kiyoshi), (2) in the Communist magazine, For a Creative Study and Completion of the Foundation and Superstructure － Letters from Readers (Japanese translation by Tomioka Yutaka), July, 1957, and (3) A Roundtable －Chinese Studies in Retrospect and Prospect (recorded by Noma Kiyoshi), September, 1957. In the field of external activities, the Institute acted as a “Foreign Trade Institute” for the promotion of foreign trade with central Japan on the basis that foreign trade was vitally important for the post-war life of Japan. Indeed, it sponsored a “Class on Foreign Trade” in collaboration with Toyohashi City in March, 1949, and sent representatives to preparatory meetings for the establishment of the Aichi Branch of the Japanese-Chinese Trade Promotion Society, and made efforts to offer good-offices for buyers from Burma. The Institute was also very active, especially in the first ten years, in sponsoring lecture meetings to meet the demands of the local people in Toyohashi and Nagoya. It frequently held such lecture meetings at City Halls, Chambers of Commerce and Industry, and on campus, mainly featuring the developments in New China and the Soviet Union, ranging from the political system, economic conditions, land reform through Mao Zedong’s philosophy, and foreign policy to women’s status in society and recent trends of literature. The Institute also invited experts from other academic institutions to lecture meetings for the benefit of students, as well as for study meetings among its members, during the same period. The Institute actively engaged in exchange programmes with overseas institutions of a similar nature. In October, 1952 the Institute received $1,000 from the Rockefeller Foundation as a “Subsidy for the Purchase of Euro-American Publications on China”. Early visitors to the Institute included Assistant Professor Marius B. Jansen from the University of Washington Institute of Far Eastern Studies on 27 November 1951, Mr. Charles B. Fahs from the Rockefeller Foundation on 21 April 1952, followed by a number of Researchers in Chinese affairs from the United States in the years that followed. In December, 1956 and April, 1958 delegations of Chinese lawyers visited the Institute. Three members of the Shanghai Institute of International Affairs paid a courtesy visit to the Institute. The Institute of International Affairs was the first institute of any kind to be established in the university after its founding in November,1946. The abundant stocks of Chinese books and other materials attracted attention from researchers in Chinese affairs both in Japan and overseas. The Institute’s members made full use of these books and materials in the first decade of its history to lead Chinese studies in Japan. But as years went by, the number of members increased and their interests extended to other regions of the world, South East Asia, for example, reflecting the changing state of affairs in the world. Thus the target areas of research have expanded to include (1) China-Taiwan, North and South Korea, (2) South East Asia, (3) The Third World, (4) European and American countries, and (5) Russia and Central and Eastern Europe. Of these areas, South East Asia is of particular interest to many members today. The first-generation members who used to be active in Chinese studies have retired, with the second-generation already ageing and the ratio of Chinese scholars to the entire staff is now declining. However, with the establishment of the Faculty of Modern Chinese Studies in 1997, almost all Faculty members who joined the Institute were concerned with research in Chinese affairs. The addition of the International Centre of Chinese Studies (ICCS) to the research and education facilities of the university is a sign of the further strengthening Chinese studies. Copyright(c)2000-Now Aichi university Allrights Reserved.